Notes: Linacre Road station was located on the Lancashire & Yorkshire Railway's (LYR) North Mersey Branch which ran from Fazakerley Junction, on the Liverpool Exchange to Wigan Line, to Gladstone Dock. The line was opened on 27 August 1866 as an important goods line linking the north Liverpool docks with the LYR route to the east. Connections to the Ormskirk - Liverpool line where provided at Sefton Junction (Aintree) going from west to north and from 15 May 1886 at North Mersey Branch Junction going from east to south (there had been a connection with the Southport line from 27 August 1866 running from west to north which closed on 15 May 1886). In 1906 the LYR electrified the line between Marsh Lane Junction, North Mersey Branch Junction Sefton Junction and Aintree. The Liverpool and Southport line had been electrified in 1904. On 1 June 1906 the LYR opened stations at Linacre Road and Ford which were served by an electric commuter service, introduced on the same day, that ran from Aintree Sefton Arms Station to Liverpool Exchange. Linacre Road station located on an embankment on the east side of the road from which it took its name. Access to the station was via a sloping path that connected the Aintree direction platform to Linacre Road. The station was constructed from timber and had two platforms. The main facilities were in a single storey timber building that was on the north side of the line at a slightly lower elevation than the up (Aintree direction) platform, a set of steps connected it to that platform. A subway ran from the rear of the building under the line and provided a connection to the down (Liverpool direction) platform. Wooden waiting shelters were provided on both platforms. Only 7 chains to the west of the station was the North Mersey Branch Junction which was controlled by a Railway Signal Company signal box located on the north side of the line. The box had opened in December 1885 in readiness for the opening on 15 May 1886 of the 35 chain connecting line to Marsh Lane Junction on the Liverpool and Southport railway. It was equipped with a 20 lever frame. Located just to the north of the station were the Litherland car sheds of the Liverpool Corporation Tramways department. One of the reasons for the electrification of LYR lines in north Liverpool had been tramway competition. 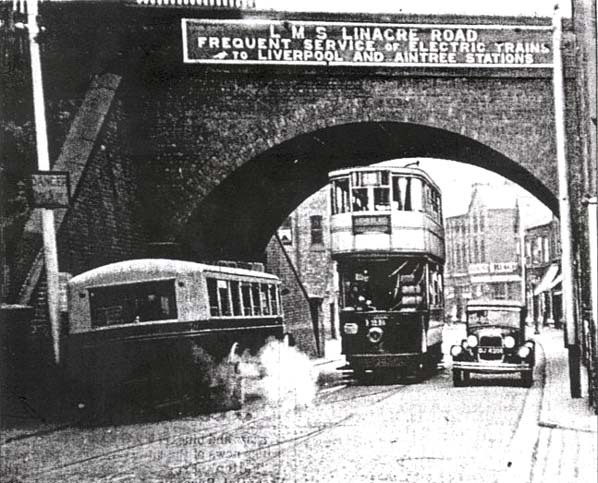 Compared to the tram the LYR could offer a much faster journey time into central Liverpool from Linacre Road station. At the time of opening a frequent service was operated Monday-to-Saturday and there were even trains on Sundays. There was also an hourly service in each direction between Aintree and Dingle. Dingle was on the Liverpool Overhead Railway (LOR) and special lightweight electric units were built by the LYR especially for through services onto and off the LOR. The Aintree and Dingle service was not a success and it was withdrawn in 1908. However during Aintree race meetings the LOR operated through trains which passed through Linacre Road. On 7 September 1914 the LYR extended the electrification on the North Mersey Branch from North Mersey Branch Junction to a new station at Gladstone Dock. An Aintree to Gladstone Dock service was introduced to serve the new station which called at Linacre Road. On 1 January 1922 the LYR was absorbed into the London & North western Railway (LNWR). In July 1922 there were 22 up and.23 down trains Monday-to-Friday as shown in the table below. On Saturdays there were 23 up and 24 down and on Sundays there were 9 trains in each direction. There was no Gladstone Dock service on Sundays. On 1 January 1923 the LNWR was merged into the London Midland & Scottish Railway (LMS). The LMS withdrew the Gladstone Dock service on 7 July 1924. The summer 1932 timetable showed Linacre Road as having 15 up and 16 down trains Monday-to-Friday. There was one less train in each direction on Saturdays and 9 in each direction on Sundays. In the period following the Second World War the service at Linacre Road had declined dramatically the summer 1947 timetable (shown below) showing only 5 trains in each direction Monday-to-Saturday only. On 1 January 1948 the North Mersey Branch became part of British Railways London Midland Region. The passenger service did not improve and it was withdrawn completely on 2 April 1951. Linacre Lane station was closed completely after the service was withdrawn. The only passenger trains to use the line after this date were the once a year services which ran from the to Aintree Sefton Arms on Grand National day. These included the LOR services which ran until 1956 when that line closed. The route was always more important for goods and after the regular passenger service had ceased it reverted to being a goods line. It remained busy into the second half of the 1960s and then decline set in. 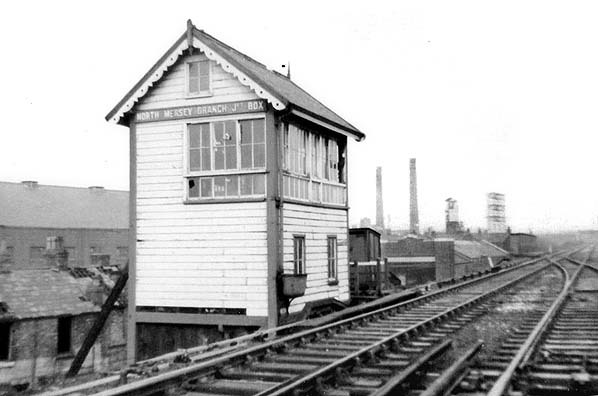 The line was de-electrified in the mid-1960s and on the 2 February 1971 the section of from North Mersey Branch Junction to North Mersey Yard was closed (there had been a fire at North Mersey Branch Junction signal box in November 1970. It was repaired but badly burned again on 1 February 1971 and it was officially closed the next day). On the 1 May 1977 the connection to the Wigan line was severed at Fazakerley Junction. 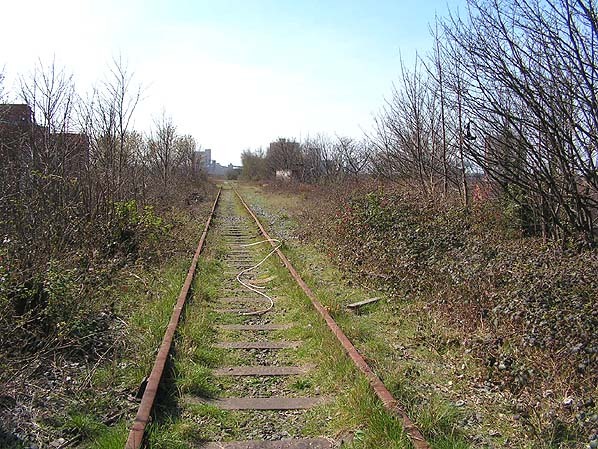 Only the section from North Mersey Branch Junction to Sefton Junction and to Fazakerley sidings which was by then an engineers depot survived. From 13 April 1986 the North Mersey Branch was singled the up line through Linacre Road station being lifted shortly after. 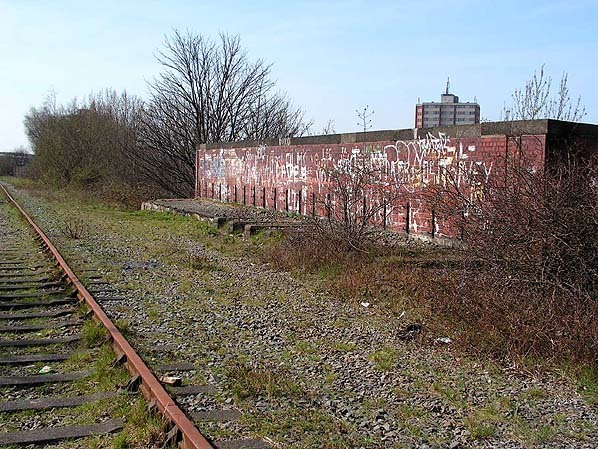 In 1987 what had become a short spur to Fazakerley sidings was closed and by the early 1990's regular goods services had ceased. Engineers trains continued to use the line until 2005 after which it fell into a state of dereliction. Since the 1970s there have been plans to re-electrify the North Mersey Branch and introduce a passenger service onto it. As part of those plans Linacre Road station would reopen. In 2014 the plans were still an aspiration of Merseytravel the local transport authority. Linacre Road bridge looking south in the 1930's. The station entrance is to the left. Linacre Road station shown on a 1:200 scale mao from 1927. 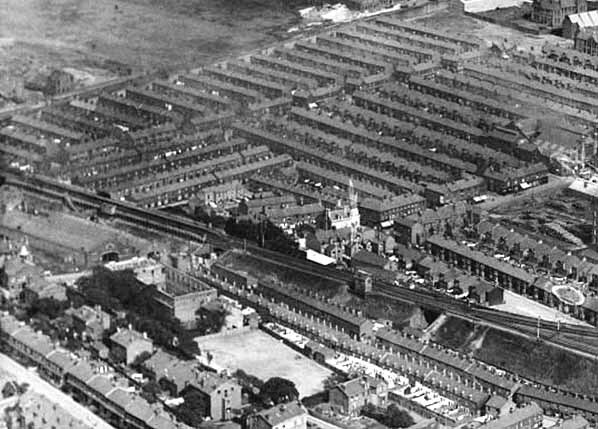 An aerial view from 1932 showing Linacre Road station to the middle left. The tram sheds can be seen adjacent to the station. North Mersey Branch Junction and its controlling signal box can be seen towards the right of the view. Looking east towards Linacre Road station from the site of the North Mersey Branch Junction. The points in the foreground are the North Mersey Branch Junction which connected the North Mersey Branch to the Liverpool to Southport Line. The signal box was destroyed by fire on 1 February 1971 which led to the closure of the docks line on 2 February 1971. 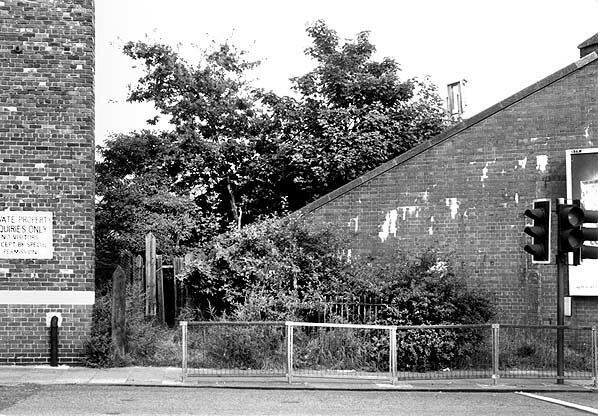 A view looking east at the entrance to Linacre Road station in August 1987. Looking west at the site of Linacre Road station in April 2007. Gladstone Dock station would have been straight ahead close to the dock buildings that can be seen on the horizon. The line can be seen turning south just after the road bridge. This was the location of the North Mersey Branch Junction. The bridge at Linacre Road looking towards the north west in April 2007.